You know how frustrating it is when you’re in an unfamiliar town and all you want is a six-pack of good beer but you can’t find it? Here in the South, at least, alcohol laws vary from town to town. You never know if beer (and wine, for that matter) will be in a grocery store or a convenience store or maybe a full-service liquor store, if such a thing is allowed. And then if you do track some down, alcohol-content and container-size rules may be so restrictive that Blue Moon — which, luckily, is my go-t0 choice in a beer crisis — is considered cutting-edge. This was the situation recently when my husband and I were in Kennesaw, Ga., for a wedding. I was running bridesmaids’ errands for the wedding party on the summer’s first majorly hot weekend (requested items were hairpins, Sprite and sunscreen) and thought I’d get some beer for my oh-so-patient husband, who was back at the hotel trying to Stay Out of the Way. Target? Nope. Publix? Nope. And even though he has developed the distressing habit of bringing home Modelo, I knew that even he wouldn’t be satisfied with the convenience store selection. Then the clouds parted and the sun shone and I saw the words “Total Wine — Spirits, Beer, Wines” on a storefront in a strip mall, and I wheeled the car in. With low expectations, I must admit. I walked in the doors and thought, “Yeah, well, this place should have something.” And then I walked further into the store, took a look around and literally stood still in jaw-dropping amazement. This place is the biggest liquor store I ever had seen in my life. Ever. Aisles and rows and shelves and racks of nothing but alcohol. I had no idea such places even existed. 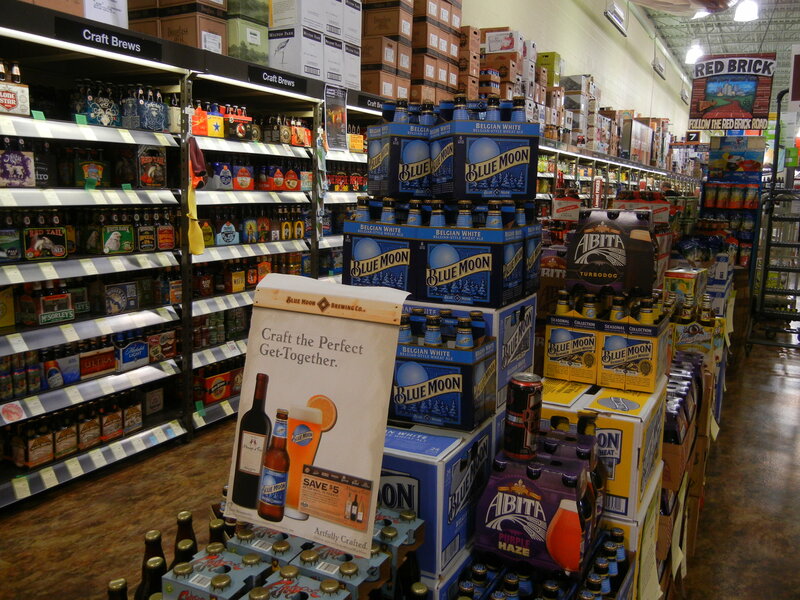 Simply walking through the beer department — a BEER DEPARTMENT — was an education. The whole rest of that weekend, I dragged folks there to prove my claim that this was the biggest liquor store maybe in the whole world. And they all did as I had done — walk in first with a smile and an “Okay, this is a big liquor store. So what?” and then, once the full richness of Total Wine was revealed, they got sort of giddy and started grabbing the shopping carts. Prices seemed reasonable and the staff was knowledgeable and helpful. Total Wine is a chain with stores scattered across the U.S. I’m not saying that if you’re within a day’s drive of Kennesaw, Ga., you should go check it out — because what kind of crazy-nuts people would drive hours just for the biggest selection of beer they’d ever seen? All I’m saying is: Just give me your list. This entry was posted in family, food, friends, shopping, travel and tagged beer, Blue Moon, Georgia, Kennesaw, Liquor store, Total Wine & More, travel, weekend getaways, wine by Coffee with Cathy. Bookmark the permalink. 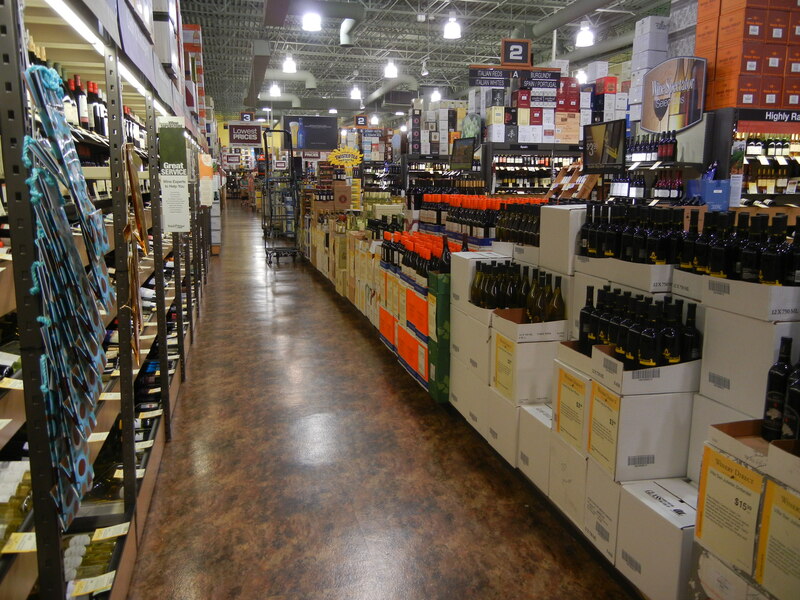 I’d be the one bypassing the beer and going straight for the wine department. Everything my wife says here is true, it was a danged big ol’ store. I bypassed the $750 bottle of bubbly in the front cooler, however, for a couple of boxes (!) of everyday wine.